Using a super-gun to counter a missile posed real technical problems. Incoming nuclear warheads are fast and high, which determines the performance requirements of the cannon fired to intercept warheads, and the flight speed must be fast enough, but must also be high enough. To address this issue, the 210 Institute conducted the first phase of exploration, which proposed the "sub-caliber artillery shells intercept" option. Upon receipt of the second year of instruction for the 640 Project, the 210 Institute carried out tests on the 85-mm smoothbore gun, which had a smaller diameter than the 100mm smooth bore gun mounted on China's Type 59/-I tank. Corresponding measures taken on a 4 kg projectile showed its velocity reached 1,200 meters / second. While this rate was 50% higher than before conversion, for the Anti-Ballistic Missile, it was not fast enough. The smoothbore gun firing sub-caliber shells tests also studied the rocket afterburner shells. 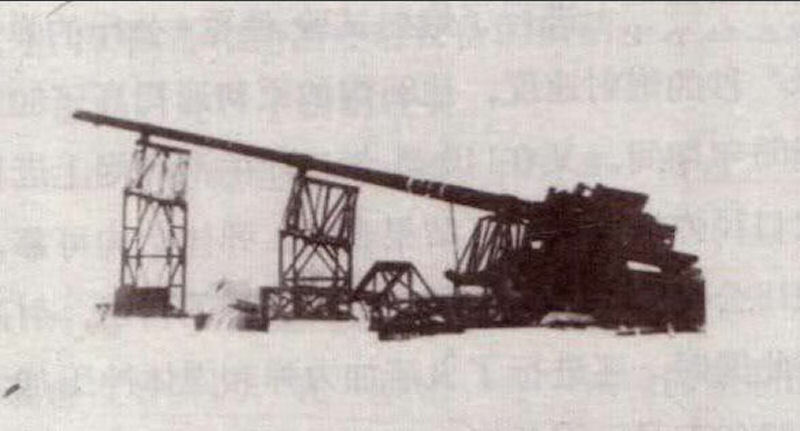 Between 1966 and 1968, under the shadow of the Cultural Revolution, 640-2 project moved forward with a 140 mm smoothbore gun, which at 5.5 inches was slightly larger than the 5 inch gun standard on US Navy destroyers. The Chinese gun fired warheads of 18 kg weight. The results achieved included a muzzle velocity of 1,600 m / sec, shot reached 74 kilometers altitude, a range of 130 kilometers, 1000 meter vertical target shooting accuracy, or 0.0168%, then the international level. , This is a great leap forward - not only that, carried out 140 artillery tests to prove: sub-caliber shells and reliable airframe structure, flight stability. The design goal was clear: to strive in 1969 to participate in interception "East Wind III" warhead tests. This was without precedent in the history of China's super-cannon, was given a resounding name: Pioneer. From the figures it can be clearly seen that Pioneer is fixed on the ground of the super-cannon. In addition, Pioneer's long barrel rests on three very unique stands in order to prevent sagging. For a super-cannon, the chassis is fixed, and from a tactical perpective that can not be said to be very good; but taking into account the Pioneer would only be used for anti-missile defense, the enemy warhead would inevitably fall from the sky, this made a rational point. After all, the Pioneer and former super-artillery mission were different from a regular cannon, so to compare purely technical performance indicators would be easily biased. In short, if the "high-altitude warhead hit" tasks is successful - from this perspective, there is no problem with Pioneer's design ideas. In order to intercept incoming warheads, there will be no chance of a second firing. In order to effectively intercept, it must be within 20 kilometers altitude - otherwise, low-altitude explosions of nuclear warheads completely lose the meaning of interception. A single-shot non-controlled rocket-propelled warhead probability of interception can not be guaranteed. To this end, there must be a dense cannon group while shooting. To adjust the intercept by the ballistic super-cannon, a rocket is equipped with no control is extremely inappropriate. And if the artillery guidance system is installed, the whole artillery missiles would be used - although they are still artillery. In this way, large-scale salvo of the blanket into a small-scale interception precision strike, its effect is much better. After much research, the 210 Institute finally changed the research direction, from the rocket assisted artillery shell to an artillery launched guided missile instead. At the same time, the study also proposed to be used to combat the low-altitude interception system, the purpose of some of which was to deal with conventional warheads. The second phase of China's super-cannon development officially began from 1970. There were probably two new technical stumbling blocks. The first was the problem of the size. In the early 1970s, in China missiles already has many forms, but it may hard to find a suitable varieties "small" enough to be able to fit into the gun barrels. The second was the acceleration overload. The overload is a G, one times the force of gravity; when a fighter does tactical actions, the instant overload can reach 7-8 G; spaceship take-off and return the maximum transient overload can go to 10 G or so. The artillery starts with a "bang", with the warhead having to bear much much more overload. Calculated according to the parameters of super-cannon, the missile probably would have to bear 5000-10000 G. Such a stressful operating environment, airframe structures, engines, electronic equipment and even the top of the missile, raise daunting, almost harsh demands - at a time when in China there is no accumulated experience in this area. All had only to start from scratch to explore matters. Starting from the gyro, acceleration table, servo system, amplifier, inverter machine, antenna, speed control, missile telemetry systems had to be tested. Through unremitting efforts, and from 1000-5000 G, artillery experiments the 210 Institute researchers ultimately concluded that some parts had been strengthened, they can withstand 3000-5000 G ultra-high overload - and the reinforcement approach to put it bluntly, is not a mystery, is to use wax or epoxy casting insulation. The gyro is the whole core of the missile components to determine their attitude. To solve this problem, the 210 Institute and Ministry of Electronics Industry in collaboration began pre-research on a new rate gyro. The result of the trials of the rate gyro was exciting. After several trials, it successfully weathered the 3000-5000 G, several tests are completely normal, has now been finalized and equipment to other missile projects. In this one area, it won the National Invention Award. As the projectile changed, the guns naturally needed to change. This time, the idea of gun design also changed significantly. In order to meet the requirements of low-altitude interceptor, interceptor does not require such a high rate of fire; to this end, the researchers selected a recoilless rifle. A recoilless rifle is kind of a bit like a rocket-propelled grenade, firing back a long flame spray. Because of the propellant combustion, a large amount of gas has an outlet that, unlike in other artillery, pushes the projectile. Therefore, it fired a projectile with a speed that was correspondingly lower. A 50 kg projectile, loaded into a 200-mm recoilless rifle caliber had a launch speed of 820 meters / second. The result of the acquisition was direct proof that a low chamber pressure, low-velocity non-recoilless rifle of conventional design was feasible. On this basis, China's largest caliber gun was designed out - it was actually had a caliber of 420 millimeters in no way inferior to some well-known super-cannon. The 16.5 inche caliber of this Chinese gun was slightly larger than the 16 inch gun mounted on US Navy battleships. Gerald Bull's super gun built for Iraq a barrel 350 millimeters wide and 45 meters long. The new 420 mm caliber cannon could fire a 160 kilogram unguided rocket-propelled warhead. Projectile speed of 2-3 times the speed of sound when the parachute and successfully. Several studies above and directly contributed to China's spacecraft, the progress of re-entry parachute recovery technology - in other words, today the success of Shenzhou VI, which also has a super cannon project credit. While researchers continue to study at the same time, the world situation was quietly changing. In the early 1970s, the "Vanguard" cannon conducted a number of tests. Although the range of the super-cannon met the requirements, unguided warheads were unable to achieve real precision. With so many Chinese cities, the need to prevent strategic attack is difficult to calculate - but if each target is equipped with a large number of super-cannon, national affordability would become a great problem. In 1972, the United States and the Soviet Union signed the Anti-Ballistic Missile Missile Treaty. This means that, through mutual restrictions "shield" the number and scope, to ensure that the "spear" is sharp, thereby ensuring the "balance of terror." Then, in 1975, the United States again has just completed an anti-missile defense area closed. And so on, can not fail to affect the decision-makers and participants in 640 projects. In February 1978, the 201 Institute submitted to the Seventh Ministry of Machine Building Industry the report of the Institute's mandate, and proposed the termination of the ABM supergun pre-research work. After two months, on April 26, 1978, Minister Song Renqiong conveyed the views on national defense: the formation of a crack team to continue to explore multi-channel Anti-Ballistic Missile; the other forces take offensive weapons research task. So the size of the project team 640-2 became much smaller. Two months later, June 29, 1978, Deng Xiaoping, Vice-Chairman of the Central Committee, held a meeting on to study what can be left to some people continue to engage. This meeting clearly set out the Department of Space 2nd Insittute direction: to put power on the development of offensive weapons; ABM model developed by the task, adjusting for individual pre-ways to explore and research. On 19 March 1980, according to the Ministry of National Defense Science and Technology Commission decision, the 640-2 project that was "super-gun anti-missile project," finally stopped development and testing. The 201 Institute also did a lot of research on the recovery projectile, including: 140 mm caliber artillery shells high overload recovery parachute test successfully; from 3000 to 15,000 G and high overload parachute recovery environment, the success rate of 100%; projectile speed of 3-4 times the speed of sound parachute and success. Several of these studies directly contributed to the re-entry of space vehicle parachute recovery technology advances.